A good salad is all about achieving that perfect balance of flavours and textures, and nothing adds crunch quite like a crouton. You can purchase pre-made croutons pretty easily, but it you want a truly great cube of golden, crispy, just slightly chewy bread, you should make them yourself. They're also dead easy to make. 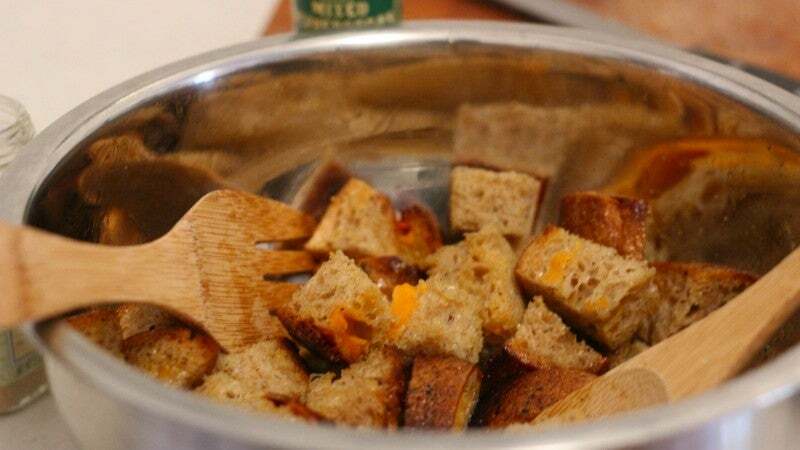 Besides giving you a tastier topper, making your own croutons is also a great way to use up any last bits of gorgeous, crusty bread you didn't quite consume before the dreaded staling. The whole process is so easy, you don't even need a recipe. 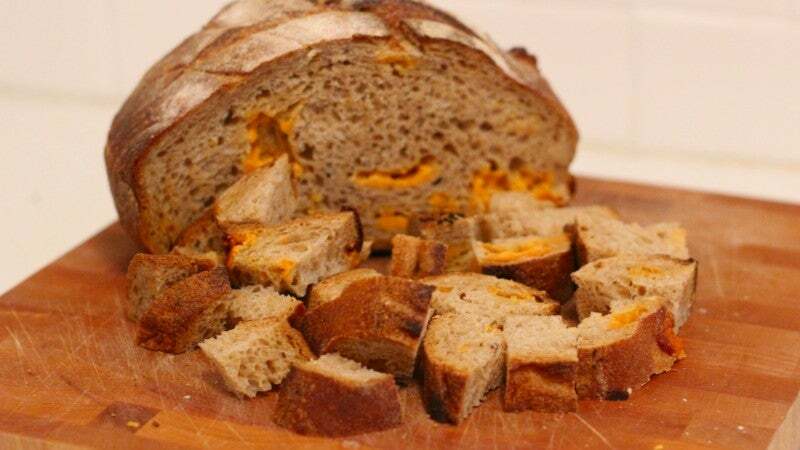 Simply take your bread - in my case, it's a loaf of cheddar habanero bread - and cut it or tear it into crouton-sized chunks or cubes. 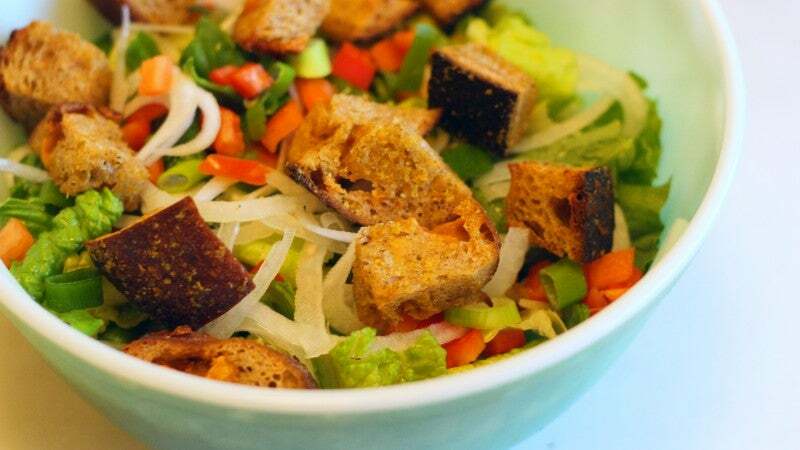 Cubes will be more consistently crunchy on all surfaces, and hand-torn croutons will have a lovely variety of textures from crouton to crouton. Both will serve you well. Once you've picked a shape and fashioned your bread into bits, toss them in a bowl and drizzle them with olive oil. The bread shouldn't be soaked with oil, but it should be visibly damp with it. I usually drizzle a little in, toss the bread around, then drizzle a little more, and repeat this until every cube has an oily sheen. Then it's time to season. Salt and pepper are obvious choices, but you can add garlic powder, onion powder, chilli powder, Parmesan cheese, Indian spices, nutritional yeast and fresh herbs. Just sprinkle it on, toss the bread around, taste a "raw" crouton, and adjust your spices as needed. 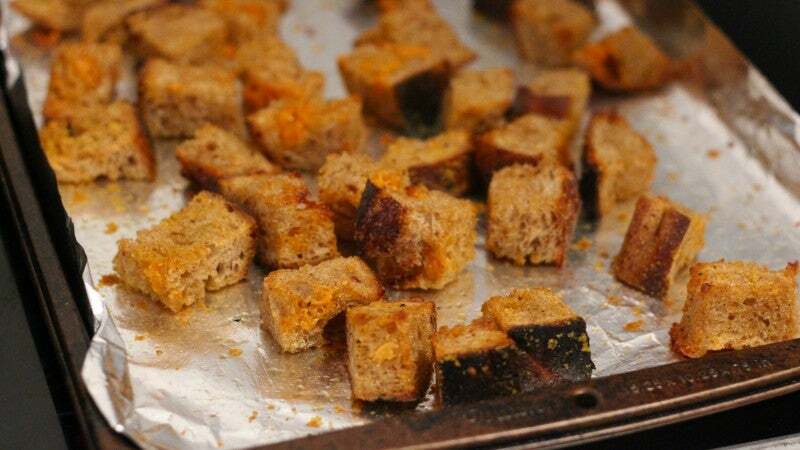 Scatter your croutons in a single layer on a baking sheet, and bake them in a 190C oven until they become golden and crisp, which should take about 15 minutes. Let them cool, and store them in an airtight container for up to a week. Use your crispy creations to add texture to soups and salads, or simply enjoy them on their own as a crunchy, carby snack.